Celebrating Last Name Brewing’s 16th Anniversary, this festival brings together some of the region’s best craft breweries for tastings, food trucks, music and fun. Proceeds benefit the Claremont Educational Foundation. 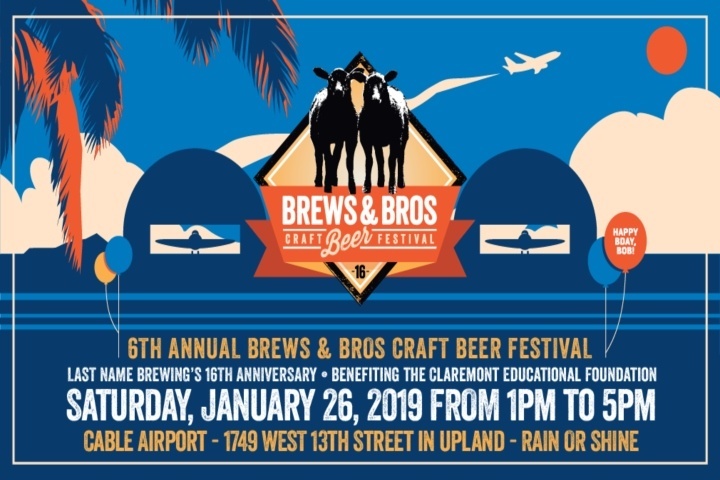 Admission includes a keepsake glass, unlimited tastings, and access to gourmet food vendors, interactive games, classic planes, music, and more! A designated driver ticket gets you into the festival at any time with access to food for purchase, music, complimentary craft soda, water and fun. The Claremont Educational Foundation is a non-profit organization founded in 1991 to promote quality public education in the Claremont Unified School District. Through a variety of fundraising efforts and relationships in the community, CEF has been able to help provide art and music instruction in the elementary schools and fund technology in the middle and high schools. Last Name Brewing is a craft brewery and tap room in Upland, CA.